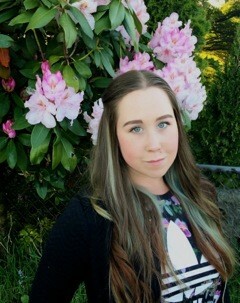 My name is Jaylin Melnichuk, and I am currently in my fourth year completing my undergrad in First Nations Languages Linguistics. 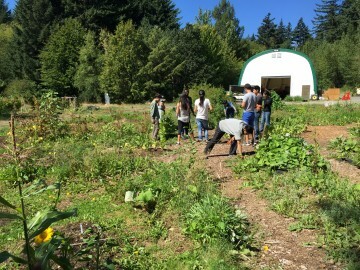 This year I am working with UBC Farm’s Indigenous Health, Research and Education garden. My internship revolves around planning and facilitating the Feast Bowl monthly community kitchen program. Since my internship started in April, I have been on a steep learning curve coming to know what it means to run a community kitchen. What a crash course! It’s always an adventure exploring a new space, learning how it runs and how to introduce new volunteers to the space for the first time! The kitchens at both the UBC Longhouse and UBC Farm centre are such well put together spaces. The summer, for me, has been a learning period with getting to know the garden where the food we serve comes from, and how that relationship frames this project as something much bigger than a once-a-month meal. 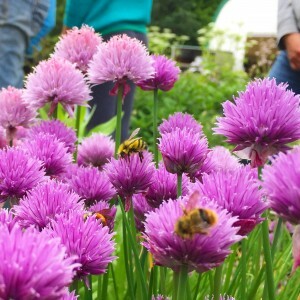 I have attending every garden session I could since April, supporting the wonderful garden interns and volunteers. There have been so many highlights for me in the garden, especially learning and working with the Medicine Collective during their workshops. This kind of experience compliments the academic literature of ethnobotany, where the vibrancy of community and interpersonal experience is absent. 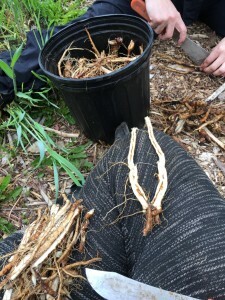 When these medicines plants are cared for and harvested by the volunteers, as facilitators we have to guide their understanding of medicine to include Indigenous ways of knowing the world. It has been an amazing experience to work with the garden interns and Elders, sharing and learning through the different perspectives they offer. There have been a few key opportunities afforded to me as an intern that have inspired me in this process! I have participated in medicine workshops in the grade and a canning workshop with UBC’s Roots on the Roof community garden club. Another one of these occasions was a community kitchen leadership workshop, put on by Fresh Choice Kitchens, who are part of the Greater Vancouver Food Bank Society. Hearing how community kitchens around the city of Vancouver operate gave me a full education as to how hard people work to maintain these programs. It awed me to find out that most organizations run multiple meals a week, feeding hundreds from diverse backgrounds around the city. The set of challenges that come with this are immense, but it has inspired me to seek out community kitchens in the future, since volunteers are a huge part in their success. One of our goals as interns is to strengthen the ties that UBC and UBC Farm has with the Musqueam community and Indigenous student base at UBC. When approaching this, I thought that it would be a great idea to have a speakers series at the monthly Feast Bowl meal! For the Feast Bowl meals happening September-April we are looking towards finding students to share their work at the Feast Bowl to not only enrich the environment, but to have a chance to share in front of their peers. So far we have been in touch with the hən̓q̓əmin̓əm̓ languages classes and Indigenous creative writing students, with Cree author and recent UBC MF.A. grad Francine Cunningham presenting at the September Feast Bowl to read from her forthcoming novel. My next task is going to be putting up posters around campus to let everyone know the Feast Bowl dates for the rest of 2015! I move forward in this internship, into the fall and winter season, with a need to reflect on what I’ve learned so far and apply it. Through the learning I’ve done this summer I’ve felt propelled into another facet of my learning. 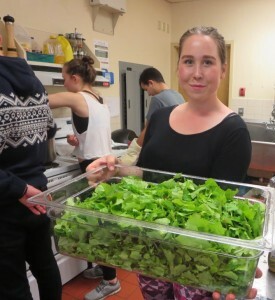 Looking at Indigenous food sovereignty, ethnobotany, language and land, it is all tied together once you’re out in the community experiencing these amazing initiatives. I am now even better equipped to think about land stewardship in a way that rejects colonialism. I am now better equipped as a linguist to understand the importance of biocultural diversity and what it means to “translate the land.” For now, I look forward to applying my kitchen knowledge to preserve more foods for the winter, creating nutritious meals for the winter months’ Feast Bowls. For now, I look to translate this knowledge into materials that will help guide the journeys of future interns, and help them gain insight into what I saw on my journey.